The arms of the crucified are open – a sign of a space in God’s self and an invitation for the enemy to come in. 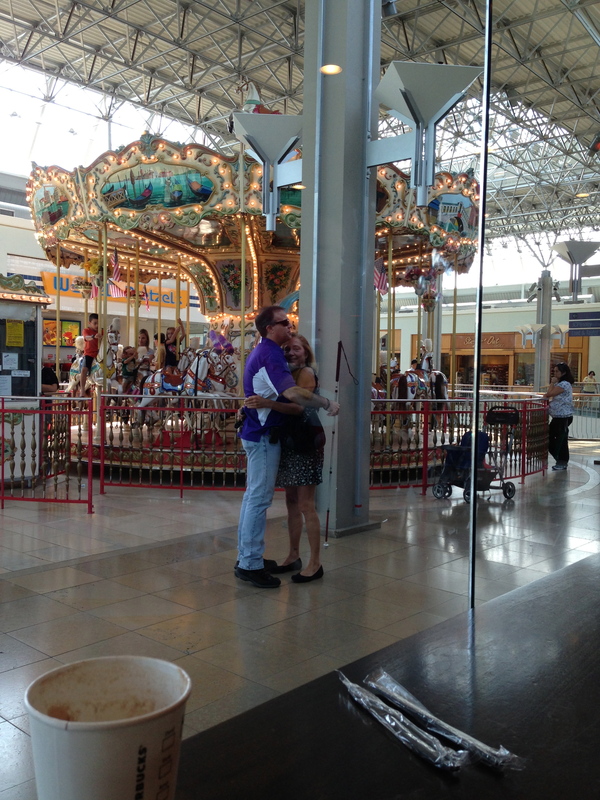 Last week, while in my Starbucks, where I write and think, the man in this picture entered into the mall. What distinguished him was that he was blind, which meant that his steps were deliberate as he navigated a complex he couldn’t see and only sensed with the aid of his cane, while walking among people and activity he could only hear. It all looked so tenuous. That is until the woman pictured here with him, greeted him, having entered from the opposite direction. It was obvious that each had highly anticipated the encounter, evidenced by their immediate delight and embrace. The joy was palpable. Upon reflection I’ve concluded that at the end of the day this is what we want. We want a God who sees us even when we don’t see Him. We want a God who has space to take us in, a Father who delights at the sight of us (Luke 15:20), and who rushes to embrace us when He has every right and reason to be punitive. Yet my tendency every day is to ‘unbelieve’ the gospel, to journey back to the Egypt of my slavery to self, to buy once again into the notion that God could never love someone so damaged and unloveable. Don’t feel sorry for me – it is arrogance, not humility. Every day I want to be my own deliverer, and every day I fail. That’s not how it works though. God is our Deliverer, and He did what the woman in this encounter did, in order to make His love credible – He came close. And His immediate proximity translated into the sacrifice of His Son. It’s funny – initially I didn’t really know how to categorize this sweet moment, but I utterly enjoyed it, and maybe that is the point. It may be that there are experiences and encounters and glimpses and scenes that God simply wants us to witness and enter into for no other reason than to reflect in small part what He has done for us in Jesus, and continues to do with his children every day. This touched something in me. Thanks Mike. your pretty good at this ! Another really good reminder! Thanks, Mike!! I think that it is very cool that the woman sees you taking the picture–sharing in her delight–and is unperturbed. It is a pure and holy moment, with no embarrassment. I am blessed by your insights, Mike. Thank you for sharing them. You are currently reading The Encounter at unfinished1.